The RamlingKhind Galli was widened to 60 feet with an aim to ensure smooth flow of traffic, but as soon as the road was built it has become into a parking lot and now the corporation has officially declared it to be one. 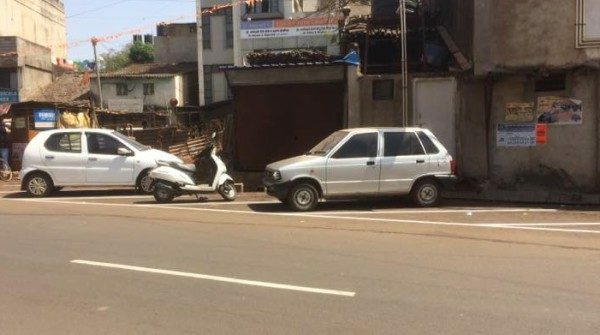 From October 1, there would be Car parking on one side and two wheelers on the other, and these sides would be changed weekly once, Cars on left side and bikes on the other and another week it would reverse. But the corporation will charge for Car parking and the two wheelers parking wont be charged. The car which belong to the residents of the Ramling Khind galli would be alloted a pass so they need not pay. It may be recalled that, when the road widening was being done there was a backlash from the residents saying it would be a parking zone and nothing else and the same has happened. None of the residents got any sort of compensation even when Law makes it compulsory for such compensation. Infact a few residents were left homeless as 95% o their home was demolished. With the street now officially labeled as parking zone from where the corporation will earn parking fees, the residents were seen speaking is this for what we gave up our home and land.